The 10-storey, 45-metre tall open-plan office complex – the tallest timber structure in Australia – establishes new frontiers in the design of commercial buildings, bringing a clear expression of its exposed timber structure to the building’s transparent envelope and promoting a warmer, more natural workplace environment of the future. 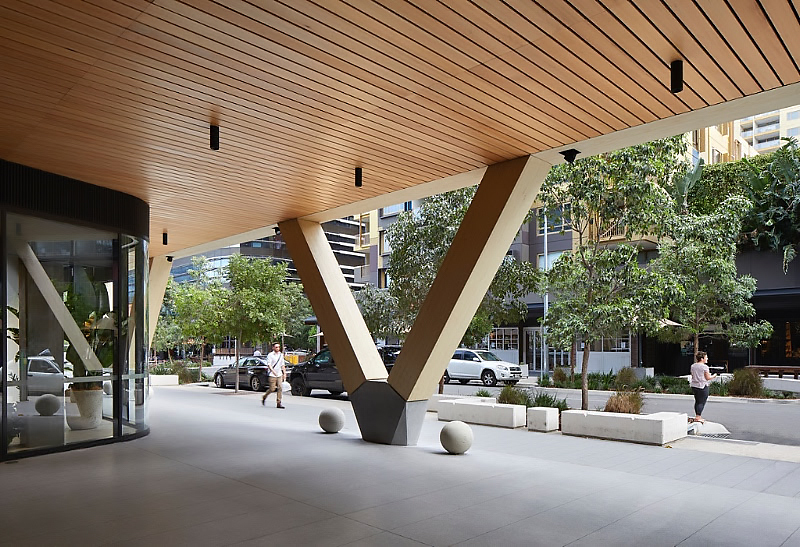 Combining honest expression of structure and materials with a sustainable ideology, the building is part of the 22-hectare Brisbane Showgrounds regeneration district. It was commissioned by international property and infrastructure group Lendlease for Impact Investment Group and will be anchored by global engineering firm Aurecon. Raised on massive exposed timber v-columns and with the south facade expressed as a ‘verandah’ of engineered timber, 25 King covertly references the wooden vernacular of the ‘Queenslander’ building type as well as nodding to the historic pavilions of the Showgrounds district. Nine levels of open-plan office space, serviced via a north-facing side core, are balanced above a ground floor shaded timber colonnade hosting cafés and restaurants, which open up the building as part of the public realm. The structure and highly flexible floorplates evolved from extensive research and testing of engineered timber typologies. 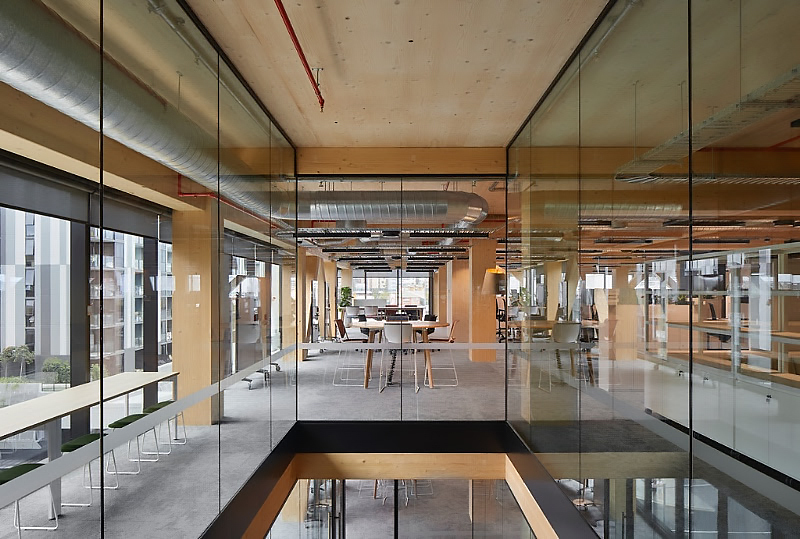 It employs a 6 x 8 metre grid in terms of both optimum distribution of columns and ceiling heights, which are determined by the span of the Glulam ceiling beams (building services ducts run parallel without the need to penetrate). The arrangement of columns creates a more intimate open-plan scale while allowing flexible and efficient spatial organisation of office floors. It also minimises the size of the exposed Glulam columns, allowing them to register almost as joinery rather than structural elements. 25 King’s innovations in rapid modular CLT construction provide significant economic and environmental benefits for clients. The extensive pre-construction design process and off-site fabrication led to a significantly shortened and cleaner on-site construction programme with minimal waste. The building was constructed in 15 months, with the facade envelope following structure in a floor-by-floor sequence. The building is projected to achieve a 6 Star Green Star Design and As Built v1.14 and a NABERS Energy 5 Star5rating as well as a WELL v16 Platinum rating. In addition to employing responsibly sourced timber, 25 King maximises natural daylighting to the floorplates through its south-facing facade while incorporating sunshades of folded aluminium on other facades to reduce heat build-up. Further sustainable features include rainwater harvesting, energy efficient lighting, optimised air-conditioning and a green wall in the entrance lobby. Bates Smart is currently exploring the potential of CLT as a new lightweight building material with major carbon benefits in a range of contexts and typologies across four states including: a 10-storey curved engineered timber ‘tower extension’ to an existing low-rise building in Melbourne’s Southbank; two five-level engineered timber buildings in Canberra, totalling 10,200sqm; and a six-level commercial building in Cremorne. 2. If CLT is exposed to fire, a process known as “pyrolysis” (whereby gas emissions from combustible components in the wood burst into flame) occurs, leaving a charring area behind it. This char layer protects the internal CLT layers which have not yet been exposed to fire thus retaining the effective structure.The process of pyrolysis and the behaviour of wood can actually be predicted (unlike steel or concrete constructions). A range of fire safety measures have been adopted for 25 King that meet National Construction Code and relevant Australian Standards. Being greater than 25m in height, it exceeds the new Timber Deemed to Satisfy solutions, adopting a range of performance solutionsthat’s satisfies the Performance Requirements, using an appropriate Assessment Method. More on Fire Regulation Compliance through Alternative Solutions https://www.woodsolutions.com.au/articles/fire-regulation-compliance-through-alternative-solutions. 4. 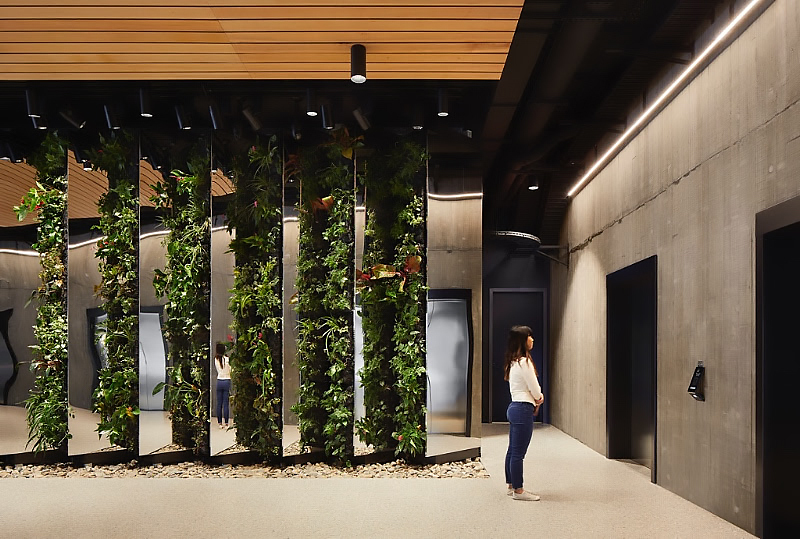 The Green Building Council of Australia’s assessment of the sustainability outcomes from the design and construction of new buildings or major refurbishments, across nine holistic impact categories. 5. National Australian Built Environment Rating System to measure a building’s energy efficiency, carbon emissions, as well as the water consumed, the waste produced and compare it to similar buildings. 6. WELL is the leading tool for advancing health and well-being in buildings globally.Project is targeting Core & Shell Certification V1, Q1 – 2018. 7. Certified by a forest certification scheme that meets the GBCA’s ‘Essential’ criteria for forest certification or is from a reused source. 8. When compared to the GBCA Green Star Design and As-Built v1.1 benchmarks.